It's getting to be that time to be out painting again! Here are a couple of recent landscape paintings that I am proud of. "Clear Light" 8x10" oil on linen board. This is a painting I did at Dillon Beach with the Plein Air Liaison group headed by Carole Gray-Weihman. Does it make you want to squint? "Languid Waters" 8x16 in. oil on canvas board. Stone Lagoon, Humboldt County, CA. 2013. 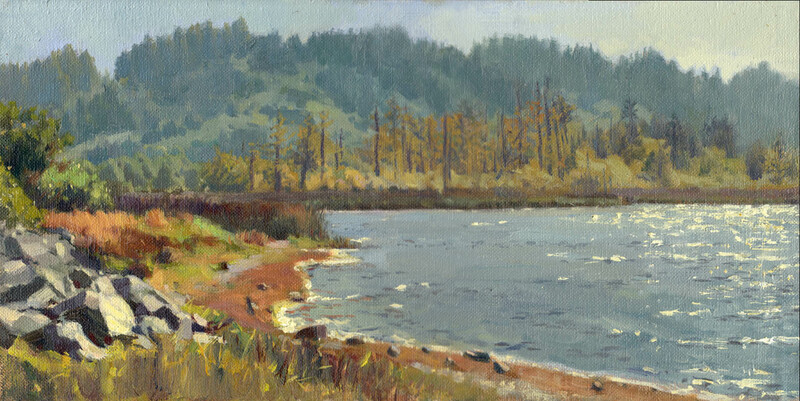 I started this painting as a plein air study, but I finished it in studio; something that I rarely do. It was a challenge to match the color of what was going on from life to what I filled in from photo. I tried to be as deliberate with my strokes as possible and create the illusion of a lot of detail with as little amount of paint-over as possible. I love painting in this area. The light quality is very unique to the area, because of the fog layer never being too far from the coast, no matter how sunny of a day. I'm submitting this painting to the OPA National Salon show.